Brittanie does a great job of getting to the core of the principles of 'Lean' and how they can be applied to the Real Estate construction business. Her knowledge on maximizing efficiency, effective teamwork and leadership, as well as technology and the built environment make her a valuably entertaining host! I highly recommend tuning into The Contractor podcast! I love the smart and actionable advice you give here. As someone in the real estate industry, it's great to get advice and hear stories from a construction point of view. Awesome stuff! Surprised me how into this show I got. Thanks! 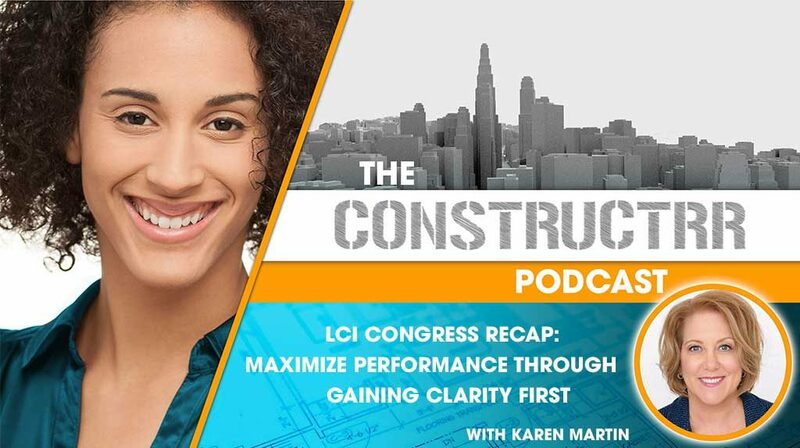 The Constructrr Podcast is an excellent show for and CRE, AEC, or FM professional. Cutting edge construction processes and tech is everything you could ask for. This is a must listen show. Sign Up for updates on new episodes! Karen Martin helps organizations use clarity, focus, discipline, and engagement to achieve higher levels of performance on financial, operational, and cultural fronts. She is president of The Karen Martin Group, Inc., a global consulting firm. Karen and her team have helped organizations such as AT&T, Chevron, GlaxoSmithKline, Epson, International Monetary Fund, Lenovo, Mayo Clinic, and the United States Department of Homeland Security learn more effective ways to design work systems, grow market share, solve business problems, and accelerate improvement. She is the Shingo Prize-winning author of The Outstanding Organization and coauthor of three additional business performance improvement books. Through her global consulting projects, keynote speeches, and work with hundreds of organizations, Karen has seen first-hand how a pervasive lack of clarity strangles business performance and erodes employee engagement. Ambiguity is the corporate default state, a condition so prevalent that “tolerance for ambiguity” has become a cliched job requirement. It doesn’t have to be that way. We talk about why some organizations don’t have clarity, the pitfalls of not setting a clear foundation and relying on ambiguous goals. And lastly, we talk about some of the recommendations she has for better organization clarity. Where to find out more about Karen Martin and her upcoming book, Clarity First. Learn more about the Lean Construction Institute at leanconstruction.org. Construction Management professional and enthusiast. I'm always researching ways to positively impact the construction industry by implementing best practices and innovative ideas, and implementing collaborative approaches.